I've been waiting for the right time to make a special, humbling announcement. After today's unexpected events, which still have me reeling (like my neighbor said--it was like watching a reenactment of the day my daughter died), now seems like the right time to tell you. For those of you who don't follow me on Instagram or missed my story today, I was on my way to the outlet mall to shop for some workout clothes for Vic. As I passed the church and fire station (like I do everyday) I noticed a large group of people lined along the fence that separates the two buildings. There were two ambulances, several fire trucks, but what really threw me was seeing a life flight helicopter in the church parking lot. My heart started racing and I immediately pulled over. I could tell it was an open house celebration of some sort to allow the public to tour the facilities. However, to add insult to injury, the place was teeming with children between the ages of 2-5. I was a woman possessed. It took all I had not to sprint to the Life Flight helicopter. It was as if I thought I was going to see Lucy lying on the stretcher. Heart pounding, I walked right up to the tall, dark, and handsome flight nurse and started asking all sorts of questions. "Have you flown from this location before? Do you remember picking up a little girl? What percentage of your patients are children? Where do they go once they are in the helicopter? Has anyone died while you were flying them? How do you do what you do??" And then, of course, I told him the whole story. He listened so patiently as he told me he is a father of 3 children himself. I hugged him and thanked him for what he does but I had to walk away. Mothers and children were starting to gather, look, and listen to my story and I was on the verge of ugly tears. I made my way to the opposite side of the helicopter (thank goodness I was wearing sunglasses) and breathed deeply while I let the tears fall as they wished. 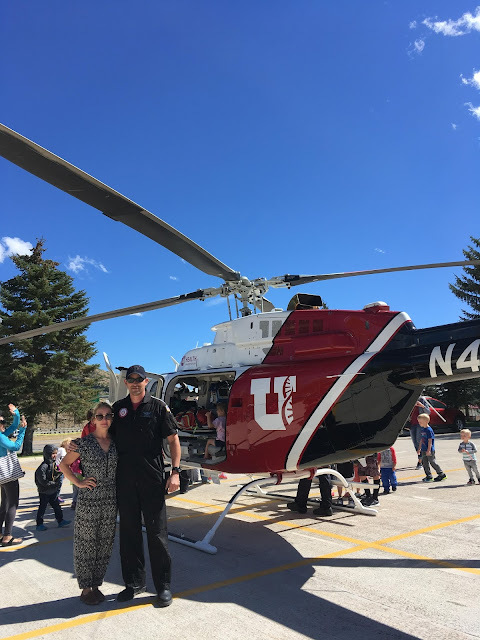 After making it back around the Life Flight helicopter, I started asking about organ donation--do you ever transport organs or recipients? Do you ever associate or work with Intermountain Donor Services? Have you heard of the Donate Life Transplant Games of America? And this is what I'm trying to get at, and what I've been waiting to tell you--I've been asked to be the keynote speaker at a very special event at Abravanel Hall next August. (Yes, it is 10.5 months away). The most exciting part is simply that I have been made aware of what the Transplant Games of America are! "The Donate Life Transplant Games are coming to Salt Lake in about one year. August 2-7. The Games participants include organ, eye, and tissue recipients from all over America. In honor of donor families each Organ Procurement Organization (58 in the US), invite donor families to attend and watch the games. They also have donor families walk in during the opening ceremonies, which will be held at Rice Eccles Stadium the opening night. It’s a pretty big deal, and the Utah Sports Authority and Visit Salt Lake City is involved with the planning. The Donor Family Ceremony will be held on Saturday, August 4th at Abravanel Hall. The estimated number of attendees at the ceremony will be around 2500 people (mostly donor families). The majority of the attendees will be from all over the United States and attending in conjunction with the Transplant Games. We are hoping that several hundred local families will be able to attend as well." Guys. These athletes, who have been given LIFE because of an organ donor, are coming to SLC next summer to compete and celebrate. How amazing is this?! I rejoice at the opportunity to share my thoughts and stories at this event and to see these athletes in action. The hearts, eyes, lungs, and tissue of deceased loved ones will be RUNNING around that field. There is no greater manifestation of HOPE, SELFLESSNESS, and LIFE AFTER LOSS. I'll update you with more details as the event gets closer if it's something you might be interested in attending. My only concern is not being able to see what's going on due to the snot and tears that will be running down my face. Deep Breath. Today was so beautiful and heavy.